We are a collegial group of faculty, grad students, undergraduates, the occasional volunteer and research affiliates within the Department of Geography & the Environment at the University of Texas at Austin. We are currently housed in both the Digital Landscapes Laboratory and the Spatial Sciences Laboratory. 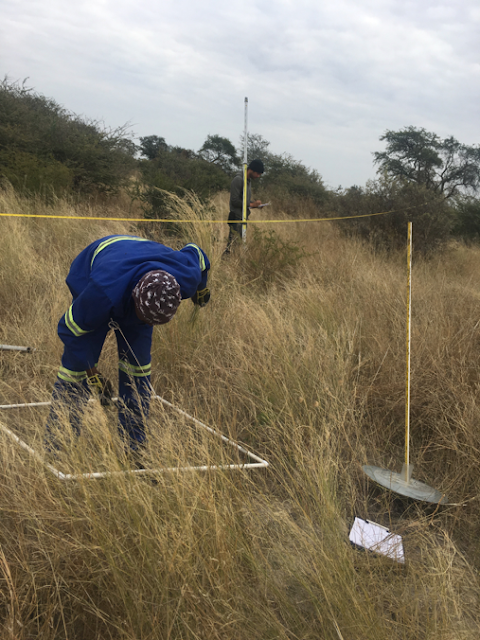 Our research spans many thematic foci within and beyond geography, with our central mission being the acquisition and integration of remotely sensed data and in situ or field data for improved spatiotemporal analysis and understanding. 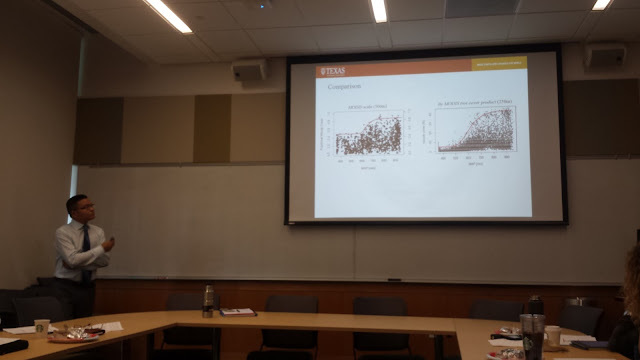 Doctoral candidate Xuebin Yang successfully defended his dissertation on October 11th. His presentation was titled "Research On Texas Savannas: Fractional Woody Cover Mapping, Potential Woody Cover Modeling, And Woody Plant Encroachment Analyzing." Congratulations, Xuebin!!! Our second burn at Thakadu Game Farm took place by the end of July. We had quite a crew on site to do all the necessary tasks, such as re-measuring the vegetation after last year’s burn, setting up a weather station, managing the actual burn and conducting all of the post-burn measurements. This year we did the first one of our 1 year burn intervals and burned an additional 3 hectare to measure the released energy levels under consideration of different fuel loads. While the first burn took place under low wind speed conditions (around 0 – 1 m/ s) we burned the second plot at higher wind speeds where gusts reached about 4 m/ s. There was a visual difference in the destruction caused by the fire at higher wind speeds. In areas with high fuel loads, we reached temperatures far exceeding those of this year’s first and the previous year’s burn. Check out photos and videos from the excitement below and don’t forget to check out Amelia and her fire extinguisher! 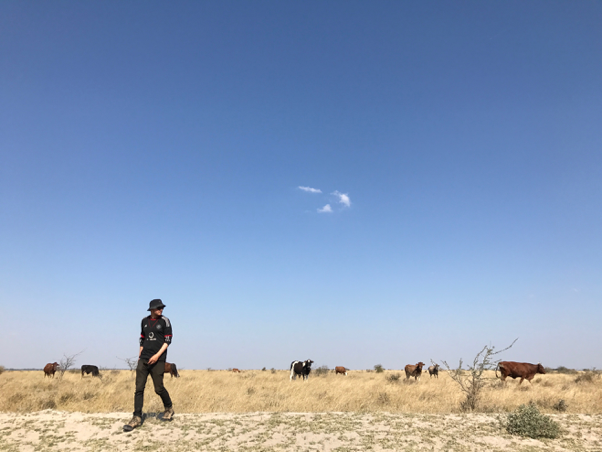 This past summer (winter in Botswana), Alex conducted field research for his master’s thesis in the region between the Central Kalahari Game Reserve and Makgadikgadi Pans National Park. This research combines biomass and structural field measurements with remote sensing methodology to employ spatiotemporal ecosystem dynamics in conservation planning. Field assistants Gift (front) and Thomas (back) collect vegetation composition and structural measurements. 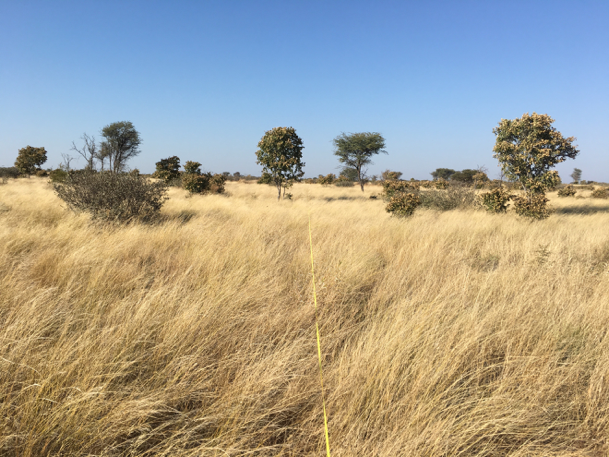 A study site near the eastern fence of the Central Kalahari Game Reserve. Alex observing a heavily grazed portion of his study area.